Located on the second floor of a residence hall, Moore College of Art + Design’s Student Services Department did not encourage easy access for the entire student population. 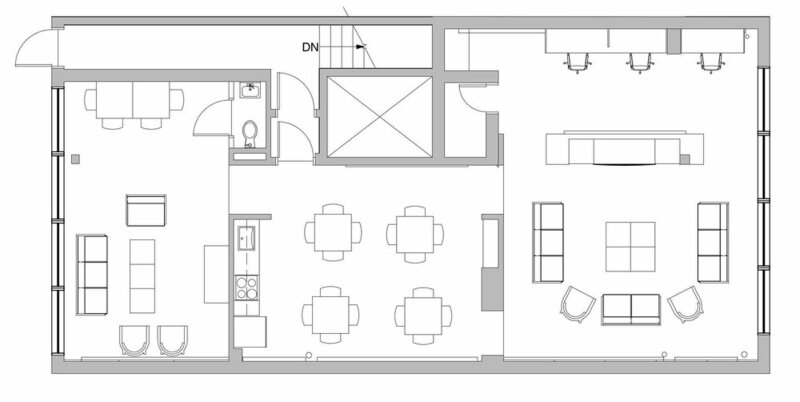 Old dormitory rooms retrofitted into offices led to an inefficient layout and insufficient space for offices, conference rooms and a larger nurse’s suite. Built in the 1950’s, the building did not meet ADA regulations which requires an ADA accessible ramp and two ADA accessible dormitory suites. After assessing their needs and the spatial constraints of the building, I moved the Student Services Department to the first floor allowing for larger Nurse’s and Bursar’s offices and the addition of two new conference rooms which would also serve as much needed additional classroom space. Converting a split level stair on the first floor into an ADA ramp and two dormitories on the second floor into ADA suites resolved the two major accessibility issues in this building. Relocation of the original first floor student lounge to the sixth floor penthouse space provided opportunities to accommodate an area for computer access and two separate lounge spaces separated by a kitchen. Working within tight budget and time constraints, I developed new furniture and finish standards for the office, conference, and lounge spaces - using the opportunity to refresh the aesthetics and reflect the artistic community that the college supports.